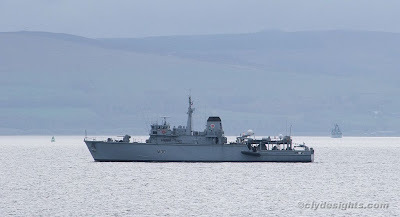 Having arrived on the Clyde a few days ago, HMS LEDBURY was seen exercising on the Upper Clyde on Thursday. Over the past year she spent some time on exercise with other NATO units in the Mediterranean, and in October 2008 found the wreck of a German Second World War bomber off the Italian coast. In the past few weeks she has been working out of Portsmouth and is now undergoing two weeks Operational Sea Training on the Clyde, in preparation for deployment in the Gulf later this summer. The LEDBURY - M30 was seen off the Kyles of Bute on the 5th and 6th of May 2009.